eD@HoMe: Chinese classical literature FDC from Taiwan! 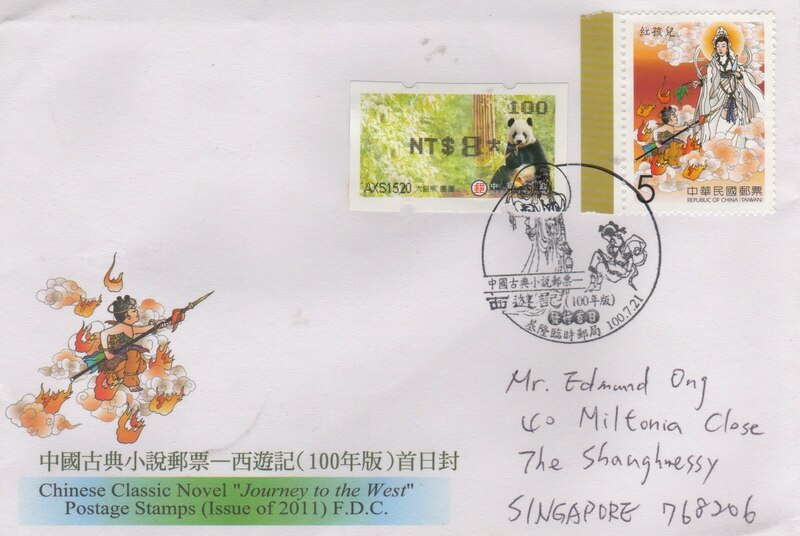 To promote understanding about Chinese classical literature, on 21 Jul 2011 Chunghwa Post released another "Chinese Classic Novel: Journey to the West" stamp set, featuring "Swindling Treasures", "Crossing the River on turtle's Back", "Achieving Nirvana" and "Red Boy" (top right stamp as seen on this FDC sent by Kia Hsu). In addition, Kia Hsu affixed a Giant Panda ATM stamp to make up for the postage. Thank you!